Recently, Regus gave me a free Businessworld Gold membership, which gives me free access to their business lounges. Today, I thought I’d pop into a nearby Regus to check it out. I had some work to do that needed close concentration and I didn’t want the distractions that often come from being in the office, so I had planned to spend the afternoon working from home, and this seemed a reasonable alternative. I was slightly concerned that it would be a bit rubbish, but figured that I could just carry on home if it was. In fact, I was pleasantly surprised. 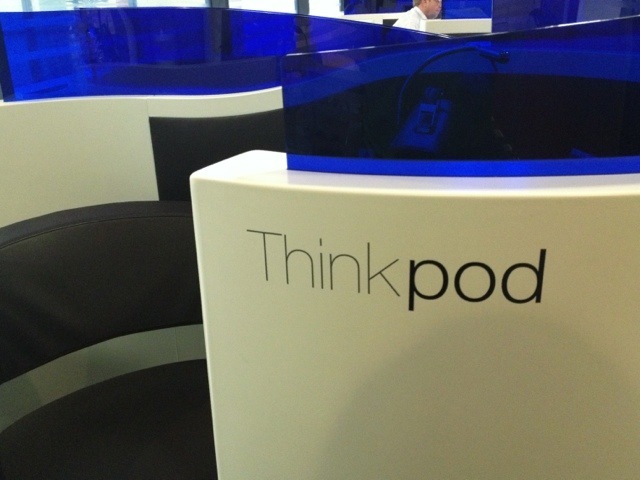 I installed myself in this ThinkPod, a sort of cocoon containing a desk, chair, reading lamp and power sockets, and worked undisturbed in a quiet environment. There is, of course, free wifi, which seemed pretty fast. There were comfy seats and free hot drink drinks available, but I didn’t use these. Basically, it was like working in a good library, but more private and more comfortable. It was much nicer than working in a coffee shop, which I’ve done a few times in the past year. I’ll definitely go back over the next year while my free membership lasts, and with over 1,000 locations in 95 countries I can see that this would be invaluable when working away from home .But I’d never dream of paying �25/month for UK access, nor �35/month for global access which appears to be the going rate. This 1,835th post was filed under: Photo-a-day 2012, Gateshead.